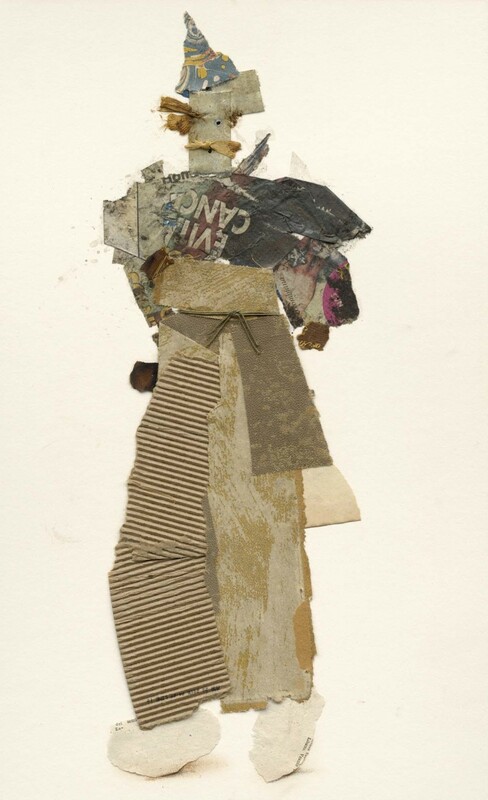 From the detritus of the studio and the street, these sculptural collages are made. 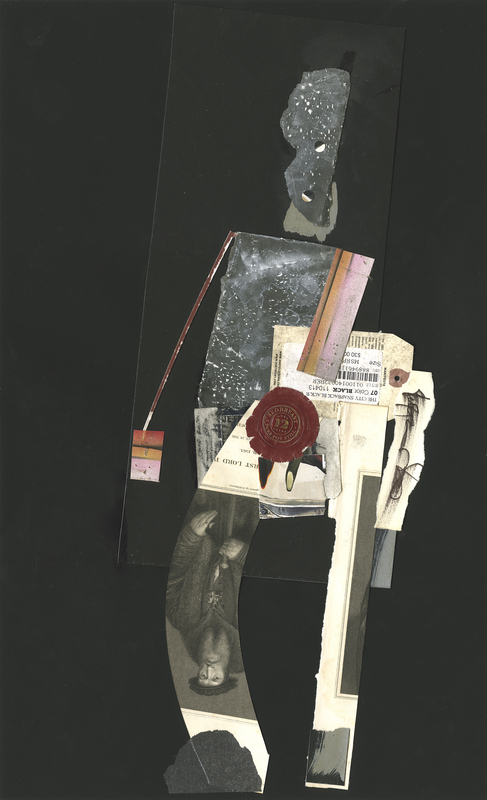 Schonzeit finds something of interest; a scrap of paper, foil, sandpaper for example, then builds his collages as one would a sculpture. Tall and Short, 2018. 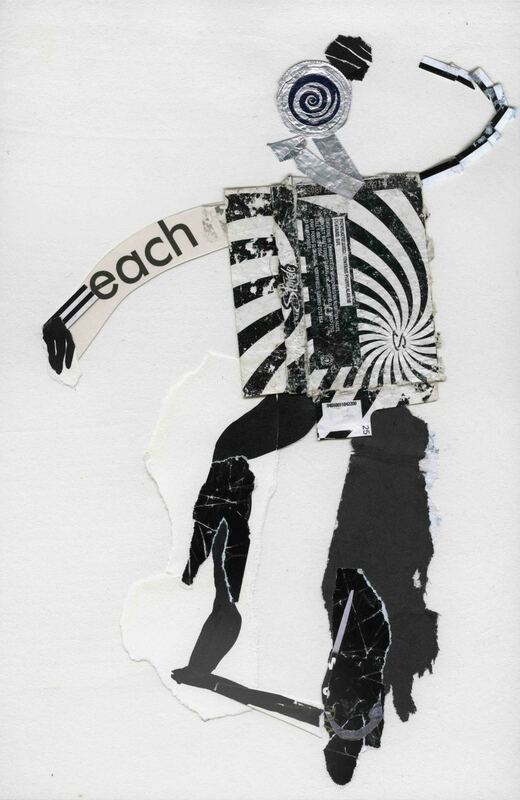 Mixed Media, Collage on Paper, 16"x8"
X-Man, 2018. 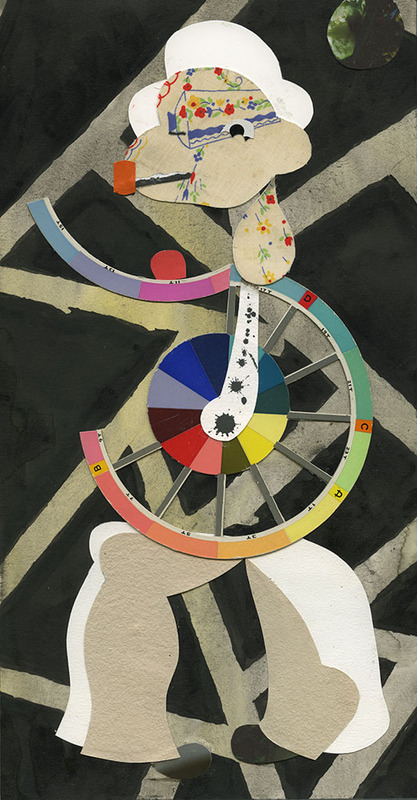 Mixed Media, Collage on Paper, 18"x14"
Shall We Dance, 2018. String and Paper Collage, 20"x22"
Two Canes, 2017. 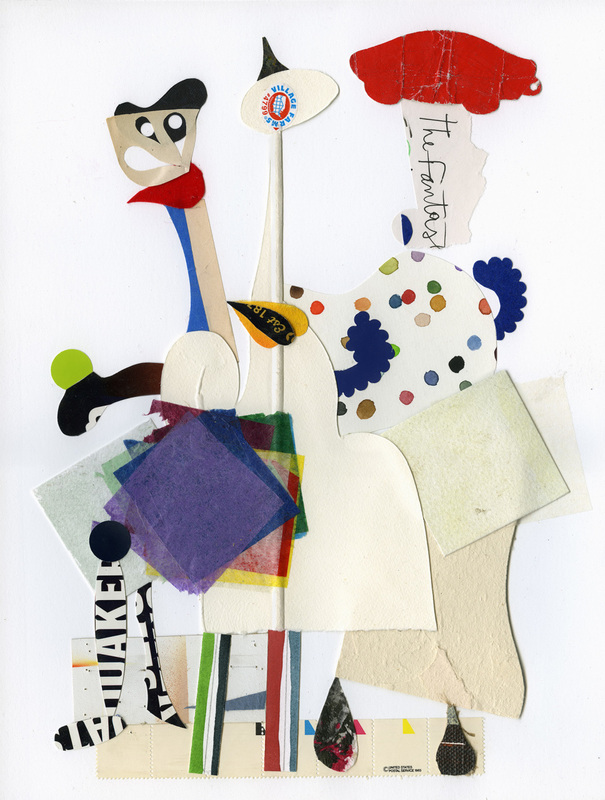 Mixed Media, Collage on Paper, 14.5"x6.5"
The Fantastics, 2017. Mixed Media, Collage on Paper, 14.5"x11"
Pompadour, 2017. Mixed Media, Collage on Paper, 12.5"x6.5"
Want the New, 2017. 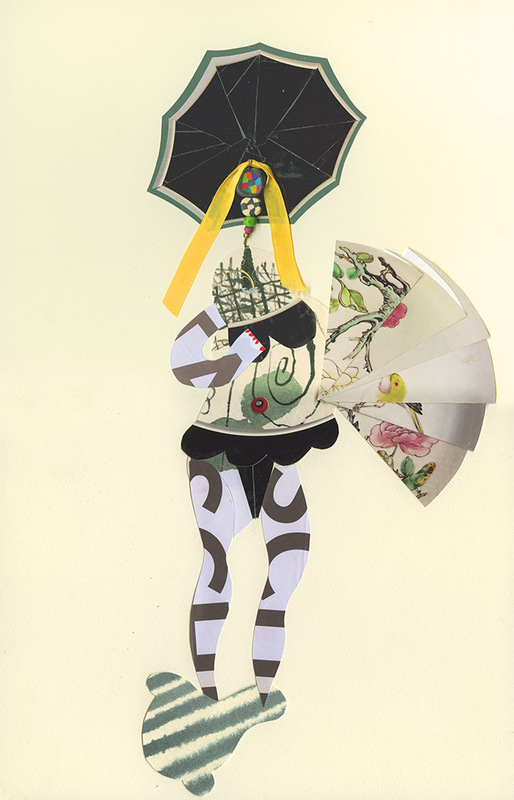 Mixed Media, Collage on Paper, 20"x9"
Iola (Pearl), 2017. Mixed Media, Collage on Paper, 10.5"x6.5"
Patch Catch, 2017. Mixed Media, Collage on Paper, 18"x8.5"
Baracola, 2017. Mixed Media, Collage on Paper, 15"x5.75"
1925, 2017. 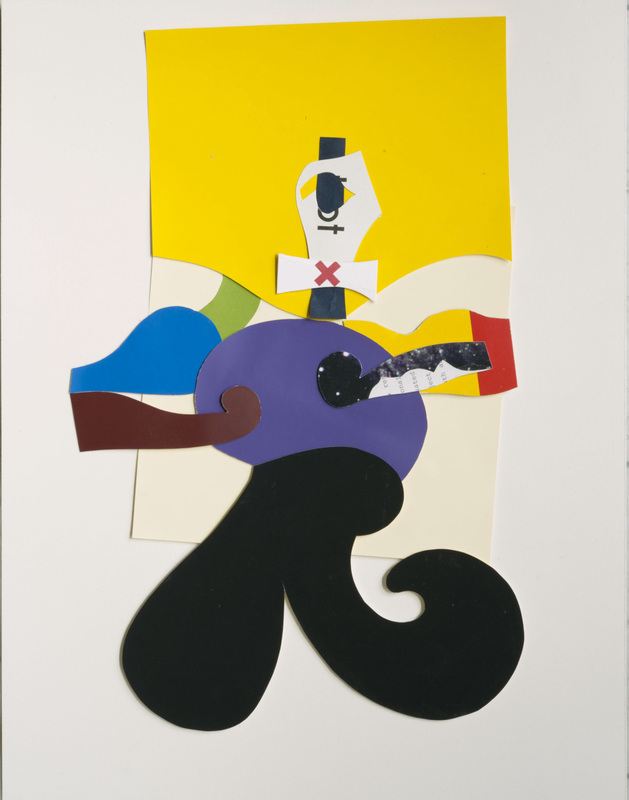 Mixed Media, Collage on Paper, 14.25"x6.5"
Popeye, 2016. 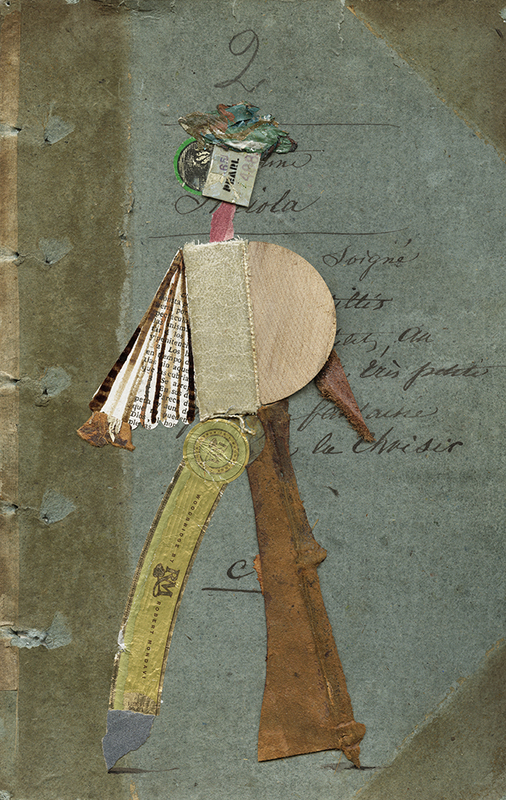 Mixed Media, Collage on Paper, 16.25"x8.5"
Man with Spear and Bird, 2016. Mixed Media, Collage on Paper, 14.25"x6.5"
Leapord Skin Bikini, 2016. 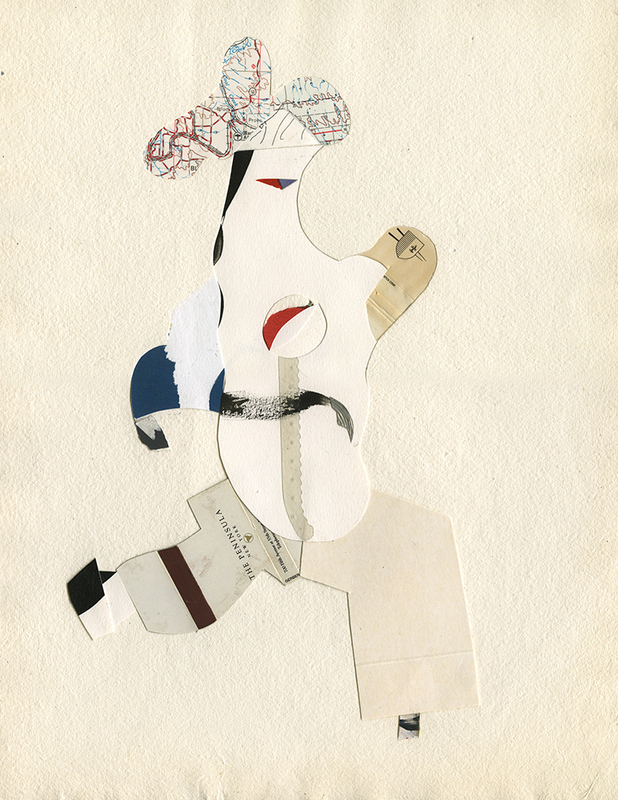 Mixed Media, Collage on Paper, 14.5"x6.5"
Two Dancing, 2016. Mixed Media, Collage on Paper, 21.5"x19.5"
Young Painter, 2016. 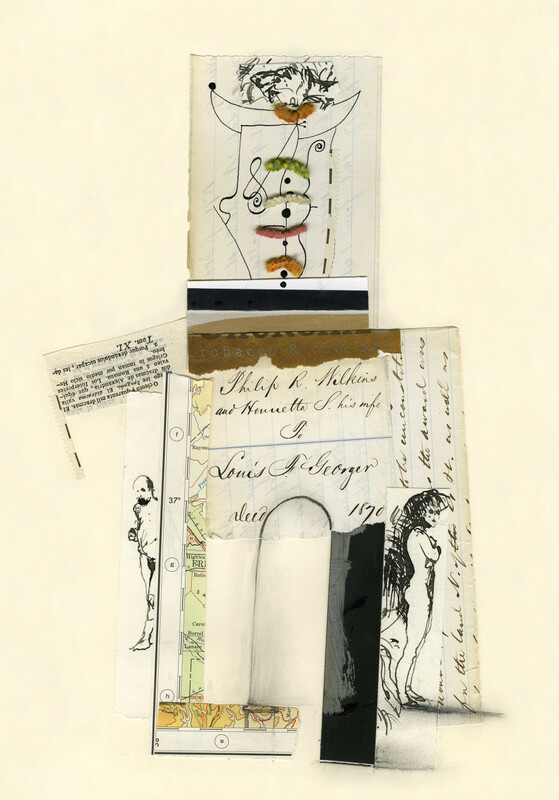 Mixed Media, Collage on Paper, 14"x6.5"
Half of Tallo, 2016. Mixed Media on Paper, 14" X 6.5"
Blue Girl, 2016. 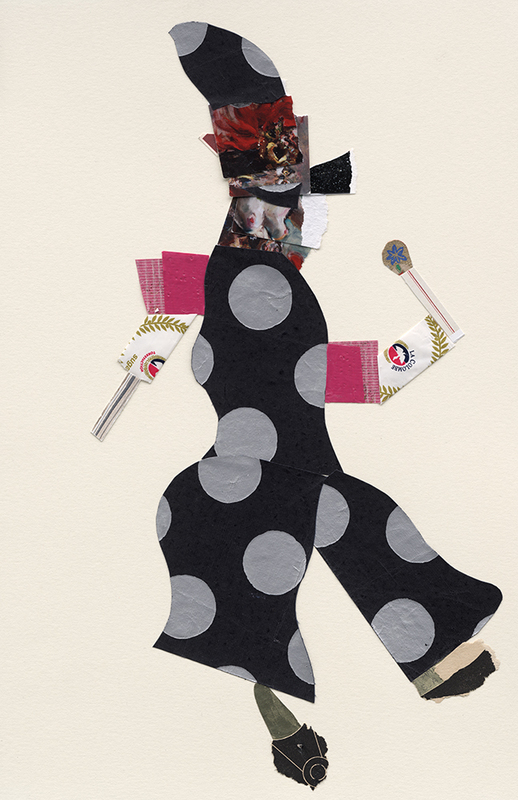 Mixed Media, Collage on Paper, 14"x6.5"
Girl Juggling, 2016. Mixed Media on Paper, 14.5" X 6.5". Lovely Seaside Girl IV, 2015. 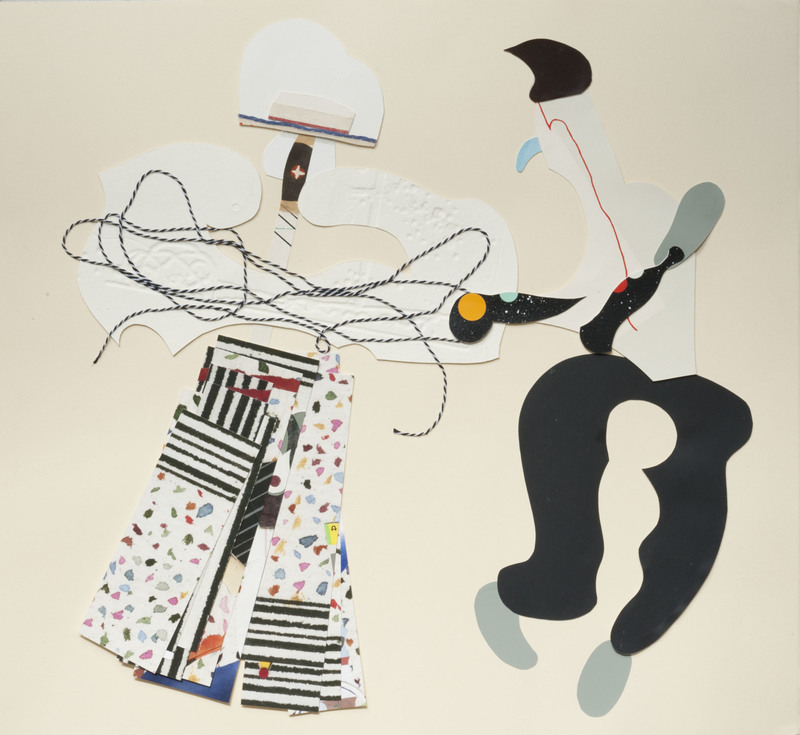 Mixed Media, Collage on Paper, 16"x10"
Girl Juggling, 2015. 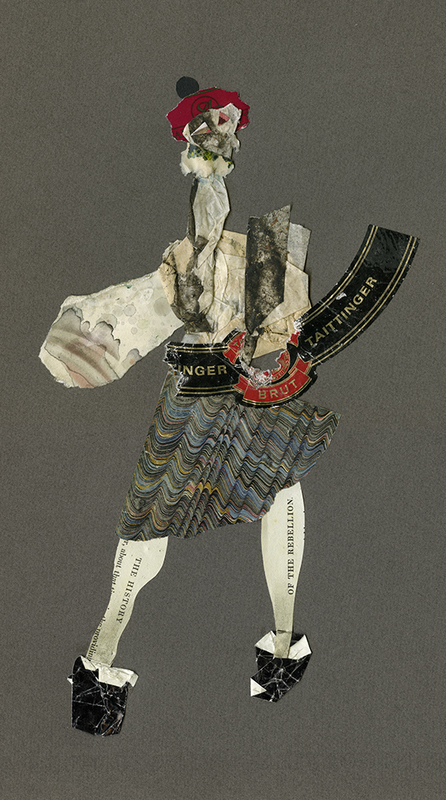 Mixed Media, Collage on Paper, 14.5"x6.5"
Healdsberg Vagabond, 2015. 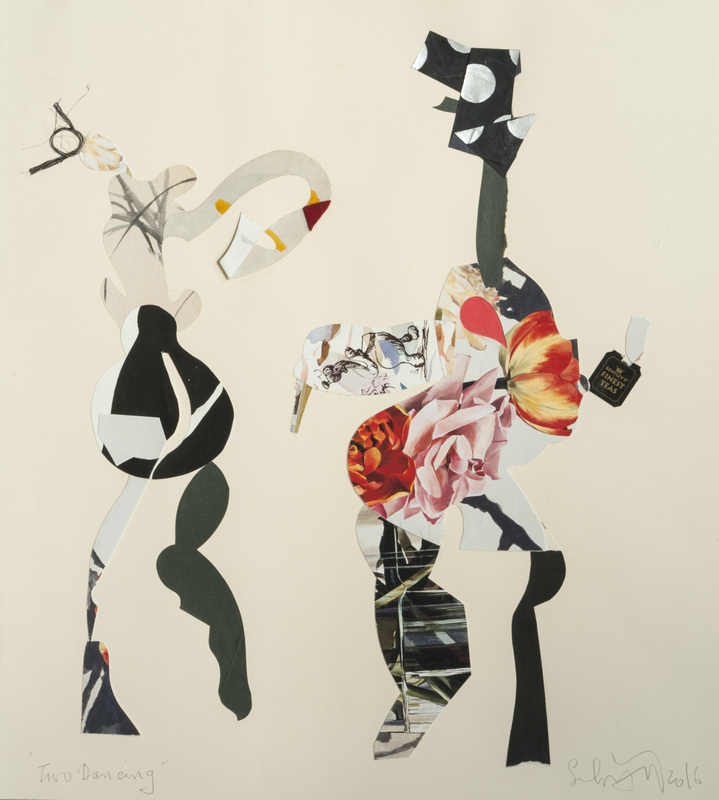 Mixed Media, Collage on Paper, 44"x28.5"
United, 2015. Mixed Media, Paper Collage on Paper, 13" X 10". To The Contrary, 2015. Mixed Media, Paper Collage on Paper, 14.4" X 6.5". Mr. Linley, 2015. 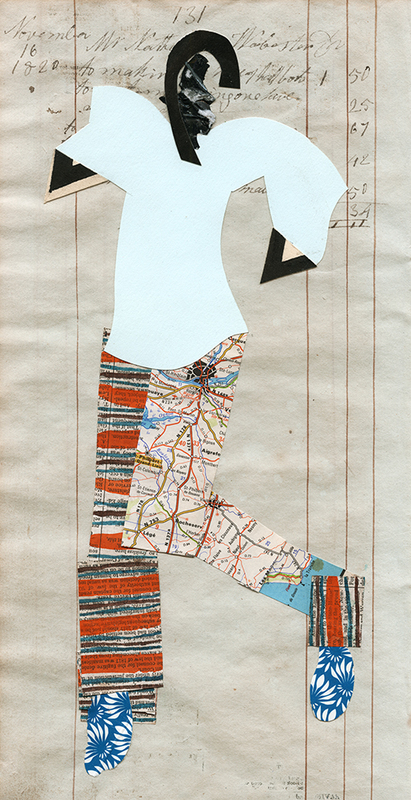 Mixed Media, Paper Collage on Paper, 14.5" X 6.5". Mr. Nathan Fields, 2015. Mixed Media, Paper Collage on Paper, 14.4" X 6.5". The Peninsula, 2015. Mixed Media, Paper Collage on Paper, 15" X 12". The History of the Rebellion, 2015. Mixed Media, Paper Collage on Paper, 15" X 9". Bellbottoms, 2015. 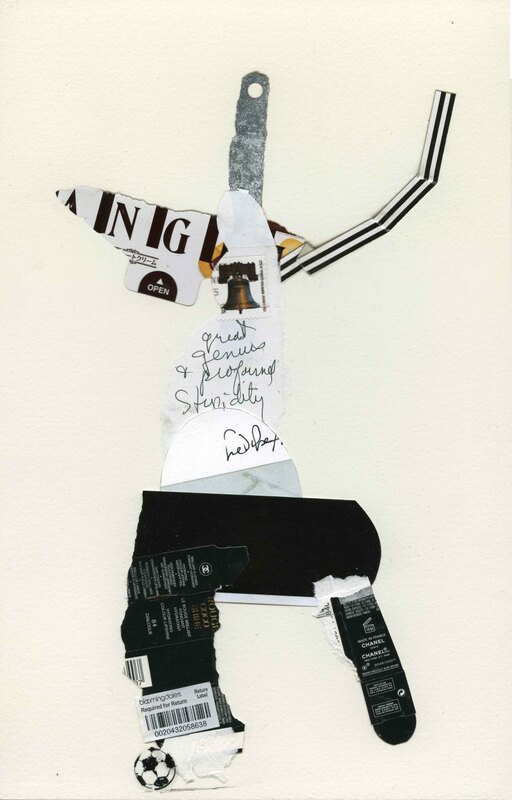 Mixed Media, Collage on Paper, 13"x8.5"
Mr. Blanshaw (Belt Buckle), 2015. 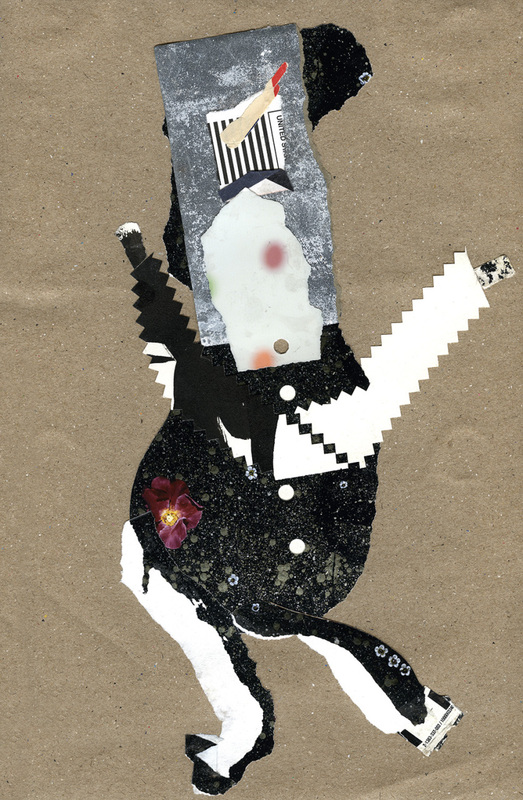 Mixed Media, Collage on Paper, 14"x6"
Black, 2014. Mixed Media, Paper Collage with Foil and Sandpaper on Paper, 18" X 11". Philip R Wilkins, 2014. Mixed Media, Paper Collage on Paper, 13" X 9". Great Genius, 2014. Mixed Media, Paper Collage on Paper, 13" X 8.5"
Each, 2014. Mixed Media, Paper Collage on Paper 13" X 8".